Several years ago, Kitch and I produced a Windsor Park story about a veteran who made a permanent mark on our souls. In honor of this Veterans Day, we would like to share that story with you. Andy Sokol was one-of-a-kind, and his kind was pure gold. This humble, unassuming man was a genuine hero at Normandy and Bastogne where he earned the Bronze Star and seven other medals for courage and valor. Yet Andy did not consider himself to be a hero. The heroes, according to Andy, were the people who did not come home. Andy Sokol is representative of the best in every person who ever wore, or will wear, an Army uniform. 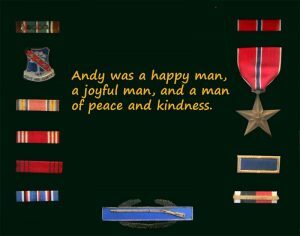 By honoring Andy, we honor his brothers and sisters who quietly serve our country with courage and honor. 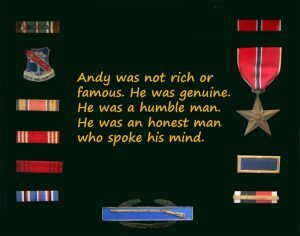 Andy was not rich or famous. He was genuine. He was a humble man. He was an honest man who spoke his mind. He was a thoughtful man who defined friendship in beautiful and meaningful ways. We first met Andy on a fall afternoon in Windsor Park. He came here to supervise his nephew, Jeff Yedloski, who was helping us clean up the gardens and get the park ready for winter. We liked him from the first hello. He was happy and smiling when he introduced us to his faithful companion, Bunny. Bunny came bounding out of the yard to be with his master and you couldn’t help but love him, too. We learned later that Uncle Andy, as we affectionately called him, had gone back to school at 69 and was the oldest graduate in his class at the Luzerne County Community College. On a beautiful afternoon, Uncle Andy and his wife, Aunt Faye, came to dinner at the greenhouse with the Yedloski family, and it was then we started to learn about his success as a gardener. He talked about starting his tomatoes from seed and the flowers in his garden. So it was a no brainer that for the Gardens That Work segment of The New Windsor Park Stories, Andy was the perfect man for the job. He became the Greenhouse Gardener at Windsor Park, and we learned more from our sessions with him than we could from reading a library full of gardening books. Uncle Andy had the proverbial green thumb but he was also a teacher extraordinaire. 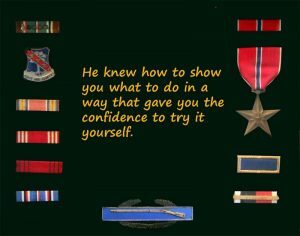 He knew how to show you what to do in a way that gave you the confidence to try it yourself. He demonstrated how to get cuttings from geraniums, root forsythia branches, plant tomato seeds, choose the right potting soil and water correctly. It was fun to be with him and learn about gardening, philosophy, values, history and a thousand other things. 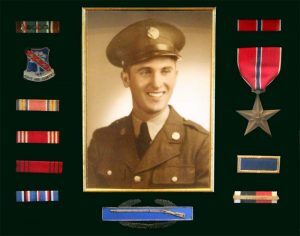 Andy was a World War II veteran who hadn’t forgotten his days in the service and proudly showed us the contents of his box of memorabilia from those years. He talked with great warmth about his career as a mail carrier in the Back Mountain and his love for the people on his route. He said he would trace the old paths on days when he felt nostalgic. In 2006, he became ill while working in his garden, and he never recovered from the surgery he had to undergo. During the last four months he tried his best to get better and get back to his real life, but God had other plans for him. We have to accept that, but we can’t help but feel sad that we didn’t have more time with him. He met the Angel of Resurrection in the shadow of Veterans Day, and he is very much missed…not only him, but his spirit, his enthusiasm, his love of life, his curiosity to learn, his kindness, his loyalty and his honesty. At least we can say that we knew him, we laughed with him, we learned from him, we admired him and we will never forget him, because his spirit is now a part of our lives. "Honor to the soldier and sailor everywhere, who bravely bears his country’s cause. Honor, also, to the citizen who cares for his brother in the field and serves, as he best can, the same cause." 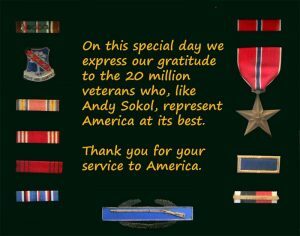 On this special day we express our gratitude to the 20 million veterans who, like Andy Sokol, represent America at its best. Thank you for your service to America.